The Apple MacBook Air is a seriously good laptop and is almost the perfect back up or travel computer for a photographer. In 2011 Apple finally refreshed their MacBook Air lineup with new SSDs using new form factor Called mSATA SSDs (also known as blade SSDs). Although Apple does offer two choices on the 13 inch MacBook Air, 128 and 256 GB (on the 11 inch you can choose 64 or 128 GB), this is one area where the MBA disappoints. The OWC 480 GB 6G SSD upgrade installed on my 13 inch Macbook air with 1.8GHz Dual-Core Intel Core i7. Apple uses both Toshiba SSDs and Samsung SSDs on the current 2011 MBA. This doesn't sound like anything to worry and really its not but you should know that the Samsung SSDs are much faster than the Toshiba units and there is no way of knowing which one you get before booting up the machine for the first time. This just takes a second. Go to the Apple menu > About this mac > more info > System Report.. > Serial - ATA. You can tell what SSD type you have by looking at the model string in a System Report from your machine. The SM prefix indicates a Samsung drive while the TS indicates Toshiba. A Samsung 256 GB drive will show up as - Apple SSD SM256C. 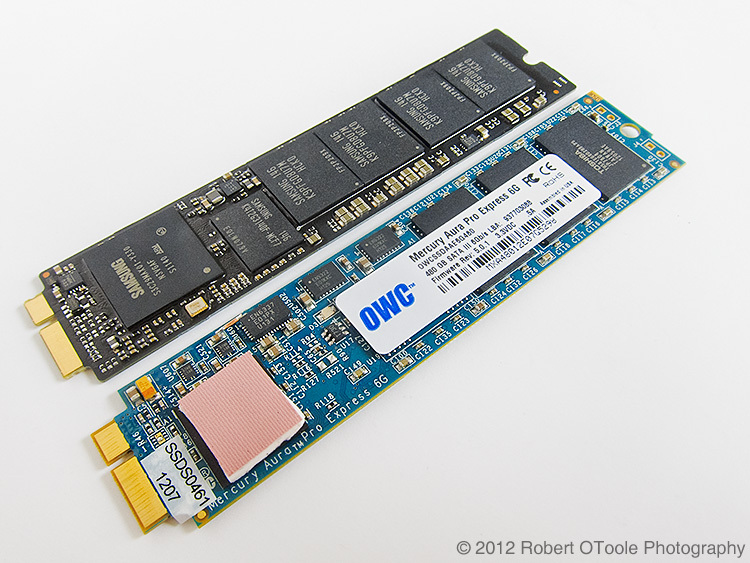 The OWC 480 GB 6G SSD upgrade and 256 GB Apple Samsung 3G SSD side by side. The pink square is a foam thermal pad. The OWC 6G SSDs are about 3x faster than the Apple Samsung factory SSDs. The 480 GB SSD upgrade costs right around $1000. The Apple 256 GB upgrade for the 13 inch MBA is $300 or $2.34 per GB, the OWC upgrade is $2.14 per GB and 3X faster and you get to keep the factory SSD for back up or other tasks. This is a great value for someone like me that needs the additional HDD space. 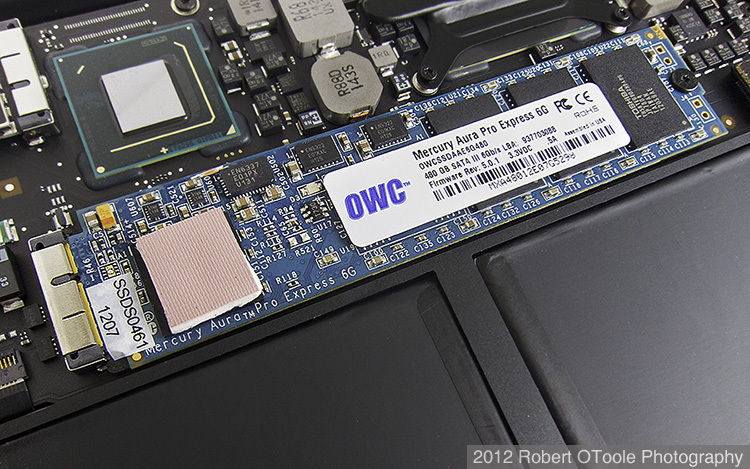 OWC's Mercury Aura Pro Express 6G SSD should guarantee a significant boost in speed and with the 480 GB model, almost twice the disk space as Apple's largest SSD. There are no other SSDs suitable for 2010-2011 MBAs, unless you find an original Apple unit on the used parts market. The installation is quick and easy only taking about 15 minutes or so. All the necessary tools for the job such as Torx and Pentalobe drivers are supplied by OWC with the SSD purchase. Make sure you use a proper container or at least a strip of tape sticky side up to hold onto the tiny Pentalobe screws that secure the MBA bottom cover.